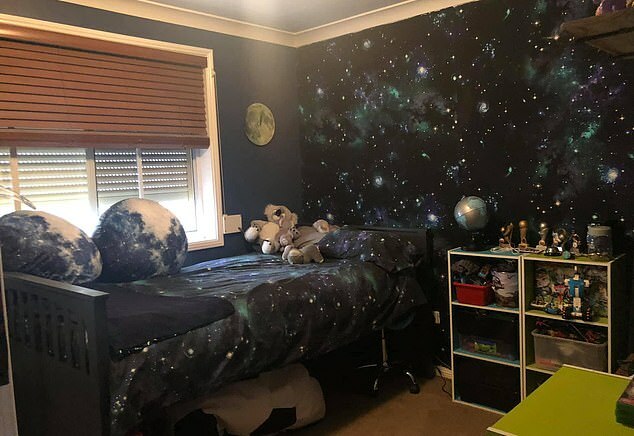 A savvy Australian mum has renovated her son’s room and created a space-themed feature wall using a $17 quilt cover from Kmart and liquid starch. 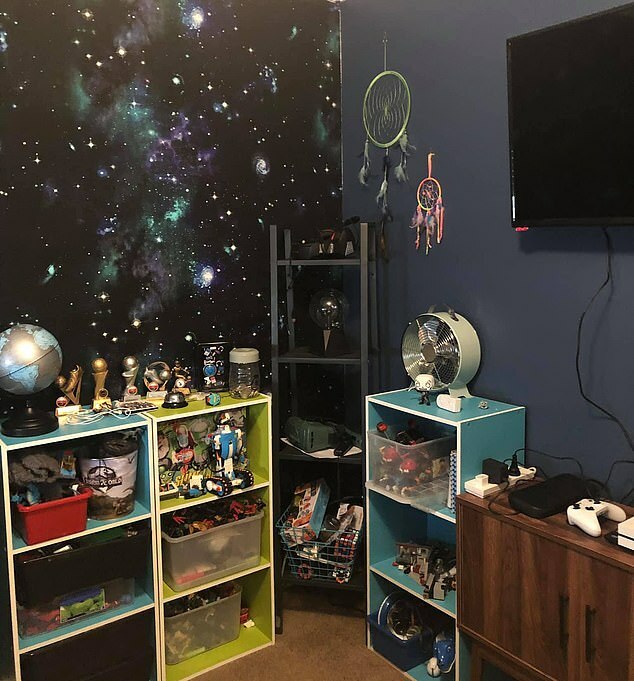 The mum revealed the makeover – which included the wall as well as bedding and ornaments – was a ‘surprise’ birthday present for her 11-year-old son. ‘I used a double doona unstitched on both sides, and then I liquid starched it to the wall as fabric wallpaper,’ the delighted mum wrote in a Facebook decorating group. 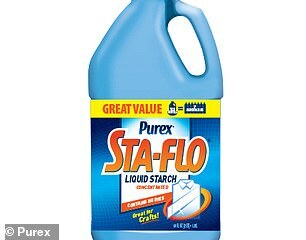 * Liquid Starch is a concentrated product that helps make ironing easier and adds body or firmness to fabrics. It is environmentally friendly and can be mixed with water to the level of crispness or stiffening you desire for fabrics and crafting. In order to make sure the fabric ‘stuck to the wall’, the mum cleaned the wall before coating it in liquid starch. This is a product that can be mixed with water and used to give fabric a stiff quality. To ensure the fabric stayed in place, she pinned it to the wall and then applied further coats of liquid starch using a paint roller. As each coat dried, she applied another coat. Further down the post, the mum said the quilt had stayed attached on the wall for the past month, and to date, there had been no problems. 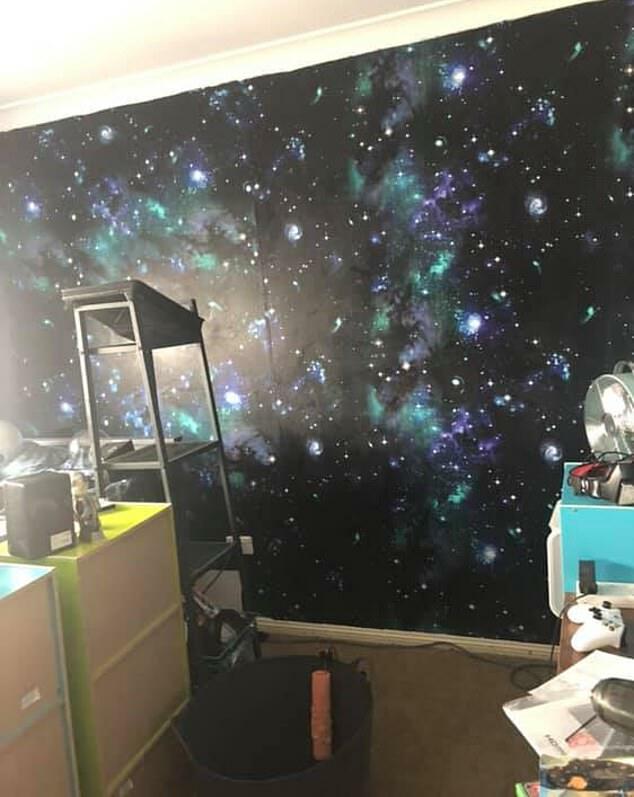 She added that once her son got sick of his space-themed room, all she need to do was wet a corner and slowly pull down. This will remove the quilt without causing any damage to the wall. Those who saw the post were quick to comment on how brilliant they thought the mum’s handiwork was and to say they were keen to try the crafty idea themselves. ‘Wow! That looks amazing! 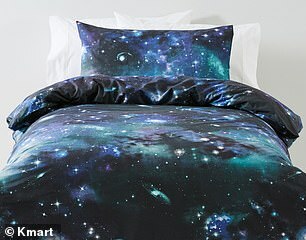 My kids have the same bed cover – they love it, but I would never have thought of putting it on the wall!’ Wrote one mother. ‘That’s so clever! Would never have thought to do this!’ another added.